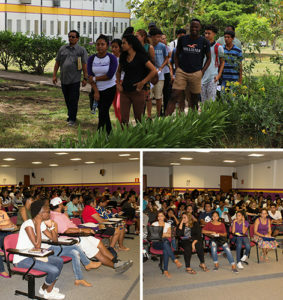 On August 1, 2000, the University of Belize (UB) was created from a merger of five institutions: the University College of Belize (UCB), the Belize Technical College (BTC), the Belize Teachers’ Training College (BTTC), the Belize School of Nursing (BSN), and the Belize College of Agriculture (BCA). Today, 18 years later on the occasion of our anniversary it is an appropriate time for pause and reflection by all of us, as a community, individually and collectively on our achievements to date, where we are as a National University and where we are going in the years ahead in advancing our vision. But this is also a time to give thanks to the Almighty and all others – the Government of Belize, the people of Belize, our current students and alumni, our Faculty and Staff for our achievements to date. 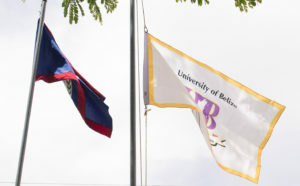 After 18 years and from a somewhat fractured history, we are now one University united in the service of the people of Belize. Every anniversary is a special time, but the 18th is a very auspicious one. It is a time in Western societies that is associated with the age of adulthood – independence and “grown-upness”. But learning, enlightment and maturity comes with each and every day, every year and through quiet reflection, we will become better, stronger and more fulfilled. As my former leader of the UWI, the late Professor, Rex Nettleford, Vice Chancellor, said many times to me, “Universities are there for a marathon race not a sprint.” But today we live in impatient societies, and the UB must respond, must deliver on its promise. Thanks for your attention and best wishes to our University for the future. I would like to extend a warm welcome as you begin what promises to be an exciting academic year. I am confident you will enjoy your time here with us. The University is filled with Faculty and Staff, who are enthusiastic and passionate about their subject matter; and as such, they are excited and strongly committed to ensuring your success in an increasingly competitive world. But UB isn’t just a gateway to a global education. We have lots of opportunities outside of the classroom that are equally rewarding and enriching and will add value to your experiences here as a student of UB. We have societies and clubs, exchange programs, an engaged Student Government and a host of other exciting activities including sports. I can assure you, you are meeting the people who will become your lifelong friends and mentors. For some, it will be an exciting time, while others may find themselves overwhelmed with all that is required as students of the country’s leading university. But do not worry, everyone at the University are keen to guide and support you and provide you will all the encouragement that you will need to successfully complete your studies. So welcome to UB. My very best wishes for a great and productive year and I know that you will enjoy your time with us. President Clement Sankat of the University of Belize has assumed the Presidency of Consejo Superior Universitario Centroamericano (CSUCA - Central American Higher Education Council) for this academic year (July, 2018 - June, 2019). CSUCA is the Council of Higher Education Institutions in Belize, Costa Rica, Dominican Republic, El Salvador, Guatemala, Honduras, Nicaragua and Panama and is based in Guatemala City, Guatemala. 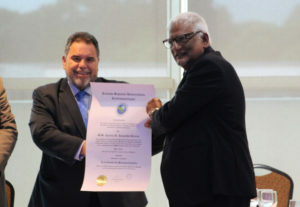 President Sankat chaired his first meeting on August 6-7, 2018 at the Autonomous University of Chiriqui (Universidad Autónoma de Chiriquí - UNACHI) in David, Panama.